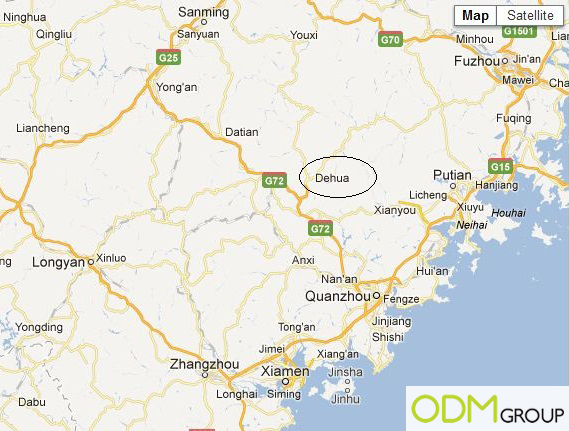 Our ODM staff recently went on a factory visit to Dehua County in China to oversee our current mass production and also do a quick QC check. 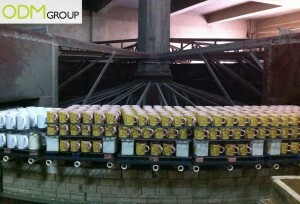 He was brought to a factory that was manufacturing porcelain products. 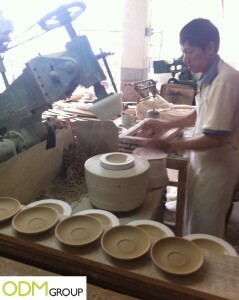 In the factory, the supervisor introduced him to the process of making porcelain products, such as bowls, plates and mugs. There were many intricate steps which involved perfect synchronisation between workers and machines. The mould is made according to the desired design provided by the client. At this stage, the size, depth, thickness and other physical variables of the mould has to be considered in order for the product to be manufactured properly. This is done using the moulding master. As it would be made according to the design that was discussed, any slight differences in the variables could result in the mould breaking. Next, the completed mould would be sent into an oven to be baked. This process involves drawing the moisture out and hardening it. Once the mould has hardened, it will be used together with a rolling machine. The clay used to make the porcelain product will be set into the mould and the rolling machine will release a spinning handle. This item will press the clay into the mould, forming the shape of the desired product. Each rolling machine has a production capacity of 3,000 pieces per day! 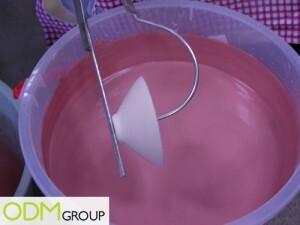 After the clay has been pressed and the shape of the product is set, workers will then use a damp sponge to smoothe away any visible mould lines. The pressed porcelain product will be put aside to dry and harden before being sent for glazing. 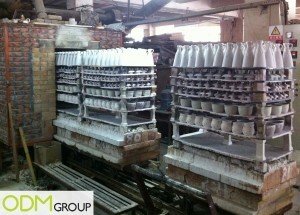 Workers will dip the porcelain product into it evenly and leave it to dry on the shelves. This step is important because uneven glazing could result in a deformed product once it is fired. Once the glazed item has dried, it would be taken into the furnace to be fired. This process allows the glaze to melt away and give the product its glossy outlook. For this to happen, the temperature in the furnace would have to be over a 1,000 degree celcius! 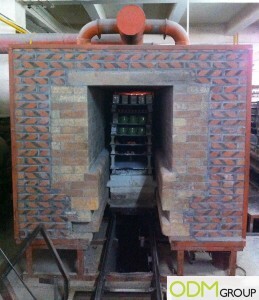 Factories usually use the circular furnace, though both the linear one is as equally effective in firing porcelain products. 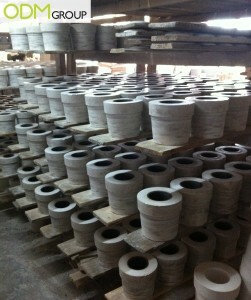 The porcelain product will be reduced in size as water has evaporated during the firing process. Decal stickers are then pasted on the glossy finished porcelain product. This is done manually by workers and precautions have to be taken to ensure the decals are pasted in the correct position. The porcelain product will then be taken to bake in the furnace again but this time, at a lower temperature to combine the decal and the porcelain product. Presto! The porcelain product is complete. The factory QC team will then check for defects such as pinholes or deformities. These defective products will be taken out and disposed of. Finally these products would be packed into either bags or cartons. To ensure all goods are made according to our clients specifications, we will send our Quality Controllers to do a Final Random Inspection (FRI) as soon as goods are finished. Need an affordable and independent QC in China? We recommend our Quality Command. 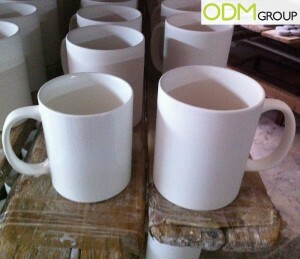 If you are interested in customising your own line of promotional porcelain product, feel free to contact our ODM team here. We’ll be more than happy to assist you in them!